1 ENHANCE YOUR CELLULAR WELLNESS BY STOPPING FREE RADICALS­ - Your body's health begins at the cellular level and anti-oxidants play a vital role in defending the cell from toxic molecules called free radicals. Essential 7 contains hun­dreds of naturally occurring anti-oxidants such as glutathione, gamma oryzanol, tocotrienols, polysaccharides, carotenoids and polyphenols. The ORAC score of a daily serving of Essential 7 is over 21,000 units (an antioxidant equivalent of over 42 servings of vegetables). For most people eating two servings of Essential 7 (1.2 million ORAC units per month) provides them with more antioxidant protection than they otherwise get in several months from eating the Standard American Diet. Essential 7 is like taking mil­lions of bodyguards into your cellular life, to keep your precious cells safe from toxic free radicals. .2 SUPPORT BRAIN HEALTH - A LOSS OF BRAIN FUNCTION IS COMMON FOR MEANY PEOPLE AS THEY AGE. This leads to a variety of mental ailments. However certain individuals maintain mental health well into their 100’s. Why the difference? According to some researchers the underlying causes of brain deterioration includes a lack of free radiacal protecting antioxidants in the diet as well as a deficiency of other brain-important nutrients. Essential 7 provides the best free radical protection available today, as well as many specific nutrients that promote healthy brain response such as: the carotenoids (alpha and beta-carotene, lycopene, lutein, and zeaxanthine), lecithin, choline, folic acid, inositol, betaine, L. Taurine, phospholipids and balanced fatty and amino acids (taking unbalanced amino acids is not a good idea). 3 INCREASE YOUR ENERGY- Many people report an increase in energy within minutes of drinking Essential 7. One of the reasons that Essential 7 increases energy so well is that it doesn't need to be broken down to be digested. It is already predigested and ready for action. Therefore, Essential 7 quickly enters the bloodstream, providing hundreds of important nutrients such as lipoic acid, pangamic acid, and squalene (an oxygenator found in shark cartilage) that "energize" yourbody. 4 BALANCE BLOOD SUGAR & MANAGE DIABETES- High sugar levels in the blood and cells accelerates fermentation and the growth of micro-organisms that increase toxin levels in the body. Fortunately, high blood sugar often responds well to good nutrition and even better to great nutrition. Essential 7 is great nutrition! Some of the ingredients found in Essential 7 that have been found to slow sugar assimilation and to help transport sugar out of the blood are soluble fiber (from RiSoTriene@ and veg­etables), glutathione, alpha-lipoic acid, natural B-Vitamins and the minerals magne­sium, chromium and vanadium. 5 LOWER YOUR BLOOD PRESSURE- Millions of Americans turn to drugs to help lower their blood pressure. 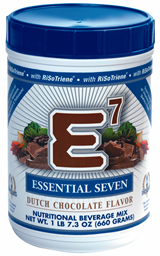 However, Essential 7 contains an ideal balance of the minerals calcium, magnesium and potassium as well as other nutrients that can help the body maintain electrolytes and avoid electrolyte stress that manifests itself as high blood pressure. Additionally, Essential 7 contains RiSoTriene@ which reduces the adherence of cholesterol plaque to arterial walls, allowing them to be more flexible and less prone to high blood pressure. 6 INHIBIT CANCER- With its-potent line-up of powerful anti-oxidants Essential 7 assists the body in warding off the many variations of this dreadful disease. Its most potent cancer fighters include: quercitin, the carotenoids, broccoli s_lenium, ferulic acid, glutathione, tocotrienols, inositol, lycopene and polyphenols. 7 PREVENT HEART DISEASE- Nutrition, like that found in Essential 7, can - provide significant help to the body in fighting heart disease. Some of the elements found in Essential 7 that can aid in this area are: Co-enzyme Q-lO, tocotrienols, flavonoids, folic acid, omega-3, magnesium, psyllium seed, carotenoids, choline, fiber and quercitin. 8 BURN FAT, HELP BUILD LEAN BODY MAss AND RECOVER FROM ExERTION FASTER- Gamma oryzanol has been found to have a lipolytic effect, which means that it helps bum fat in order to provide energy. RiSoTriene@, a major component of Essential 7, provides the highest density of gamma oryzanol in nature. This naturally occurring gamma oryzanol and ferulic acid combination found in Essential 7 not only increases muscle mass, but also improves strength and body com­position, decreases body fat, enhances recovery times after exertion and thereby lessens muscle soreness. 9 FIGHT DEPRESSION- Almost nothing overcomes depression better than a feeling of energy and wellness surging upward from within your body. Because of its abun dant nutrition Essential 7 simply helps people feel this vibrant energy and power fror within. A few of its componei\ts that have been found to help counter depression ar natural B- Vitamins, calcium, magnesium and biotin. 10 MAINTAIN HEALTHY CHOLESTEROL LEVELS- Components found in RiSoTriene@ such as Gamma Oryzanol, Phytosterols (inc1ulding beta sitosterol), Inosite and Omega- 3 work to lower LDLs (bad cholesterol) while raising HDLs (good cholesterol). 11 SLEEP BETTER- Though the initial response to Essential 7 is one of wellness and energy, because it delivers a full complement of nutrients and minerals to the bod: people sleep better than ever before and wake up rested and energized. MENOPAUSE - Essential 7 is highly effective at reducing symptoms of stress. Thos who have compared Essential 7 to drugs that are used to control menopausal stress not that Essential 7 does the j.ob better with no side effects. Several studies performed wit Gamma Oryzanol in Japan also indicate improvement with menopausal related issue such as headaches, low back pain, fatigue, dizziness, and appetite loss. 13 HEALTHIER HAIR AND SKIN-The essential oils and overall nutrition in Essential 7 aid in tissue growth and repair. They help counteract wrinkling, brown spot: psoriasis, dry and hard skin and other skin damage resulting from oxidative damag< This is why many people report an improved complexion when taking Essential 7. 14 PROTECT YOUR VISION- Our eyes require good nutrients to avoid cataraciand macular degeneration. Gamma Oryzanol in Essential 7 helps cells in the eye repair themselves quickly. Additionally, lutein, quercitin, lycopene, glutathione, an zinc are some of the components found in Essential 7 that promote good eye health. 15 LOSE WEIGHT- Because of the abundant nutrition of Essential 7, many peepIe lose their cravings for unhealthy foods. Others replace meals with Essential 7. Bot of these promote healthy weight loss. Also, Essential 7, with its soluble fiber, enzyme and essential oils, helps promote general detoxification of the body's cells, which leac to permanent weight loss. 16 ENHANCE THE IMMUNE SYSTEM- In studies in the U.S., Japan and Inditocotrienols, like those found in Essential 7, have been demonstrated to promote T-ce development and thus enhance the immune system. 17 DFCREASE THYROID PROBLEFMS- Two Jananese exneriments showed th: oryzanol in nature. This naturally occurring gamma oryzanol and ferulic acid combination found in Essential 7 not only increases muscle mass, but also improves strength and body com­position, decreases body fat, enhances recovery times after exertion and thereby lessens muscle soreness. 18 PREVENT KIDNEY STONES AND OSTEOPOROSIS RiSoTriene@ has been shown in both animal and human studies to reduce calciun excretion through the kidneys. Increased calcium excretion is linked to the formatioJ of kidney stones. Another advantage of conserving calcium stores is the reduction iJ calcium deficiency problems such as osteoporosis. 19 INHIBITS ULCER PAIN-Gamma oryzanol has been shown to have significaranti-ulcer activity. 20 RELIEVE SUGAR CRAVINGS AND MOOD SWINGS- The RiSoTriene in Essential 7 helps those who suffer from blood sugar swings (with the resultant energy drops, sweet cravings and irritability). Also, hypoglycemic symptoms such as fatigue shakiness and brain fog can often be relieved within minutes. .
21 CLEANSE THE BODY OF TOXINS- The fibers and essential oils in Essential provide the means of removing toxins from our bodies. People who are deficient in oil tend to absorb more oil-based environmental toxins like a dry sponge soaks up water. A healthy body with sufficient oils will instead repel such chemicals, much like the oil in duck's feathers causes the_ to repel water. TAKE THE WEIGHT LOSS CHALLENGE TART NOW WITH THE WEIGHT LOSS CHALLENGE WEATHER YOU NEED TO LOSE A LITTLE WEIGHT TO LOSE A LOT THESE PRODUCTS ARE DELICIOUS AND FUN AND THE BEST PART IS THEY REALLY WORK!!! COMING SOON..